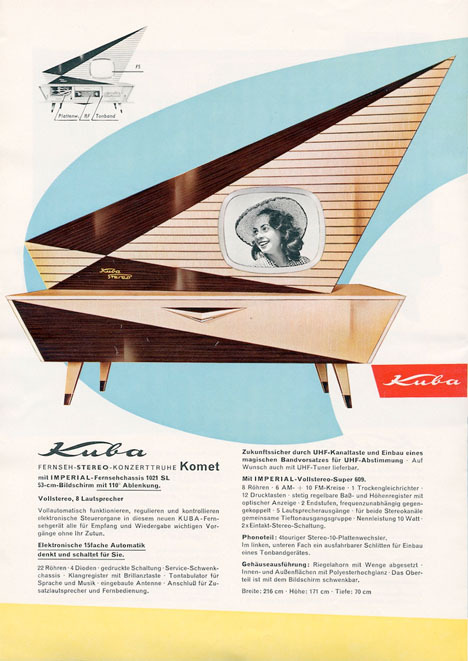 Early television sets ranged from tiny screens housed in laughably oversized cabinets to stylish midcentury modern designs. 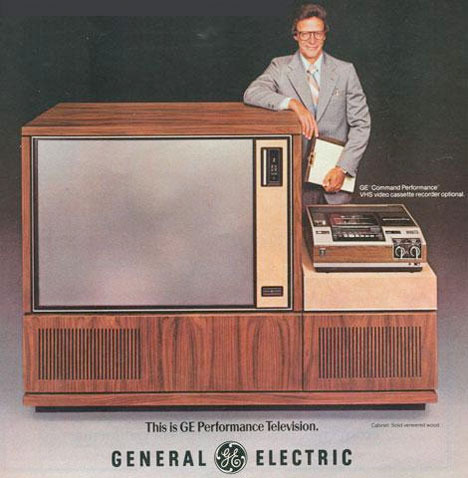 Some, like a Russian TV from 1932, don’t even look remotely like the televisions we’re familiar with today. 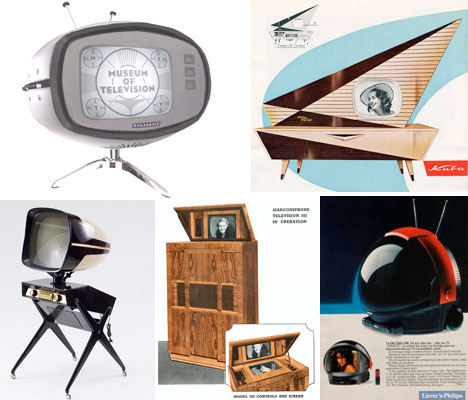 Here are 13 historical TV set designs dating from 1928 through 1991. 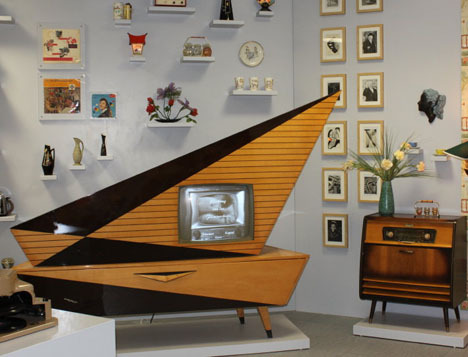 How cool is this midcentury modern TV console? Shaped like a sailboat, it features an upper section that rotates like a sail on a mast so you can tilt the 23-inch screen in the desired direction. The lower cabinet holds additional multi-media features with a pull-out, 4-speed phonograph, a TV tuner and a multi-band radio receiver. 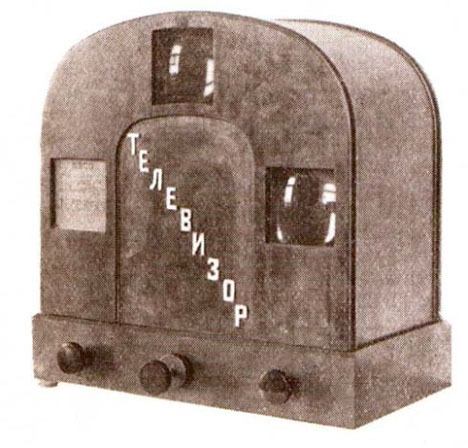 The first television set that was available to the public in Russia looks exactly like you would expect – basically, as if it were a piece of military equipment. 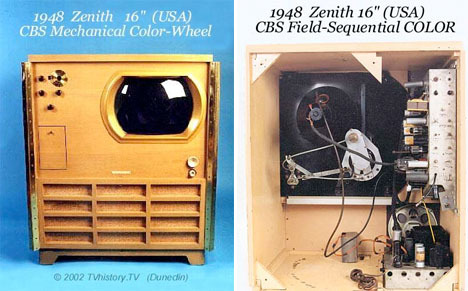 Before ‘real’ color TVs were available, CBS labs came up with this contraption – essentially a black-and-white television equipped with a spinning mechanical wheel of red, blue and green filters that added color to the picture seen on the screen. CBS was all ready to start selling these things when RCA protested that an all-electronic color system (which they were researching, but had not yet developed) would make more sense. Ultimately, the Zenith design was briefly used as a teaching tool for surgery, but never sold to the public. 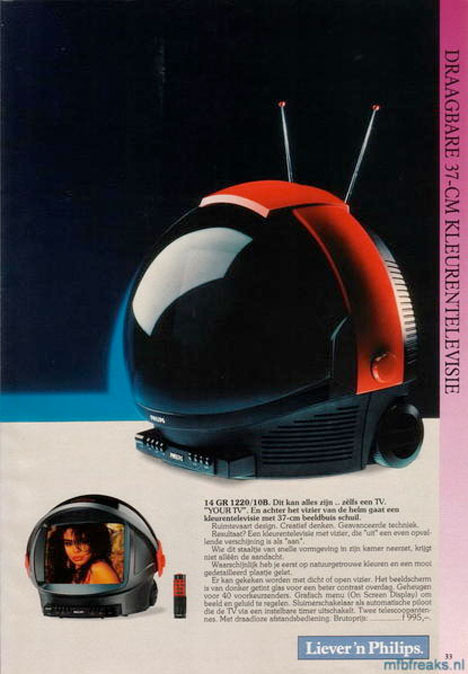 This novelty television didn’t really do anything special – it just looks cool, modeled after a space helmet with a closing lid. They can still be found on eBay for under $100.